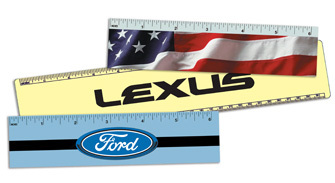 Rulers are the ideal promotion for schools, colleges, libraries, art supply stores, etc. 7" Ruler. Thickness can range from .018" to .030". They are also coated with a high gloss laminate for a brilliant finish. Please contact Plastic Works for larger sizes and/or other options.